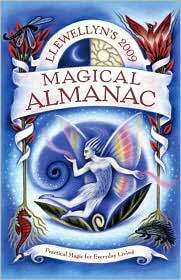 It’s been nearly 20 years since this almanac was first published, and it has been one of Llewellyn’s most consistent offerings. Within thirty seven articles divided into four categories – Earth, Air, Fire, and Water) the 2009 edition offers a good range of topics for readers to enjoy. While I don’t always agree with the correspondence of the articles placed in each section (Raven Digitalis’ “Dark Culture” article is more appropriate for earth, rather than fire, for example) the variety of articles is superb. community in your area, family as coven, tattooing, Ganesha's birthday, clock magic, cauldrons, magic in times of trouble and how to properly retire your magical tools. Many of our favorite authors – Ellen Dugan, James Kambos, Elizabeth Barrette, Lily Gardner, and Paniteowl, to name a few – are back, along with some newcomers. The almanac, as I’ve said before, is just fine. It’s not the reason we buy this annual. And although I do not agree with every point of view or opinion proffered, it does not matter, because I can happily recommend the annual to any witch looking to learn something new or get reminded to go exploring into an area just a little deeper than before. This is an easy book to dip in and out of, moving from section to section in no particular order. As always, the writing excellent while the voices are as different as the perspectives. Even better – the articles remain fresh even as the years go by. Highly recommended. Five broomsticks out of five.